Please contact us with the contact form to report difficulties, strange behaviors or persistent problems, and quote the program name or the number 20230 . This is the download page for Retail Man POS - Retail Man POS is used internationally to create a computer system with powerful Point of Sale and Inventory, Accounting features included. Resellers in more than 50 countries. Support is included for most leading brands of POS hardware :- docket printer, bar code scanner, cash drawer, pole display, touch screen, scales. 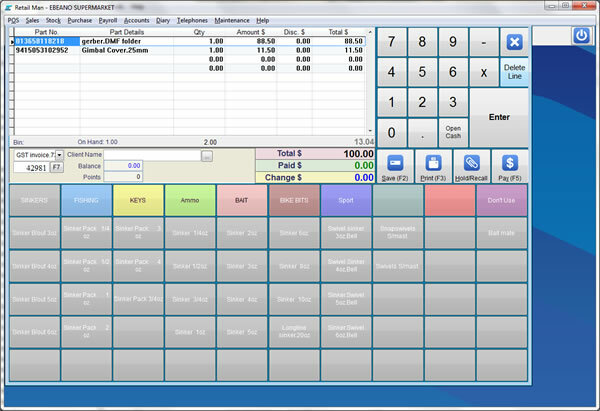 Retail Man features a simple user interface with powerful security. Ideal for most shops and retail outlets. Manage the inventory of stock to maximise the return. Quick Menu Buttons for commonly sold items.